VAMDC bridged the gap between atomic and molecular (A&M) producers and users by providing an interoperable e-infrastructure connecting A&M databases, as well as tools to extract and manipulate those data. The current paper highlights how the new paradigms for data citation produced by the Research Data Alliance in order to address the citation issues in the data-driven science landscape, have successfully been implemented on the VAMDC e-infrastructure. For the last decades, data and software have redefined the way of carrying out science (Hey et al. (2009)). The current volumes and complexity of data that are now being collected, produced and processed, and their inevitable increase require new tools, techniques and ways of working. A number of principles and best practices for the management of scientific data have arisen, and a consensus is being reached around themes such as data identification (Wittenburg et al. (2017)) or FAIR principles (Wilkinson et al. (2016)). In this fast evolving landscape of data-intensive science, the citation is an anchor: it remains a key element in the production of new knowledge, since it enhances trust (the new results are based on proven/solid bases and a scientist does not need to prove again a used result), makes the process described by the cited work reproducible and gives credits to the author of the cited intellectual product. According to the FAIR principles, most of the data should be re-used in derived works: the role of Citation is crucial in open-data-driven science. However, the classical citation paradigm used in scientific papers (mostly hand-made bibliographies and referring to other papers) is incompatible with the current data-deluge (Bell et al. (2009)): on one hand a huge number of digital data (with disparate origins) may be used in a given paper; on the other hand the evolution of digital data is very rapid and not systematically reported. In the context of the Virtual Atomic and Molecular Data Centre we aimed at addressing these issues at the data-community level and in 2014 we joined the Research Data Alliance. The RDA, through its Data Citation Working Group1 and RDA/WDS Scholarly Link Exchange (Scholix) Working Group,2 has defined new models for citation in the digital era. In this paper, after recalling some technical elements of the VAMDC e-infrastructure (section 2.1) and the recommendations coming from the RDA-Data Citation WG and Scholix WG (respectively section 2.2 and 2.3), we focus on how these recommendations are implemented ov0er the existing VAMDC E-infrastructure (section 3 and 4 respectively for Data-Citation and Scholix). After describing the ongoing/further works (section 5) we conclude with discussion (section 6). The Virtual Atomic and Molecular Data Centre (VAMDC, (Dubernet et al. (2016))) is a political and technical framework for operating and sustaining a worldwide digital research infrastructure, built over two European FP-7 projects ((Dubernet et al. 2010); (Zwölf et al. 2014)). The e-infrastructure federates in an interoperable way about 30 heterogeneous atomic and molecular databases. By providing data producers and compilers a large dissemination platform for their works, VAMDC succeeded in removing the bottleneck between data producers and the wide body of users of that data. The “V” of VAMDC stands for “virtual” in the sense that the e-infrastructure does not contain data: it is a wrapping for exposing in a unified way a set of heterogeneous databases. An ad hoc generic wrapping software, called the node-software (Regandell et al. (2018)) transforms an autonomous database into a VAMDC federated database, called data-node. Each data-node accepts queries submitted in a standard grammar (VAMDC SQL Subset (VAMDC Consortium (2012)), a subset of SQL as it names indicates) and, by implementing an interoperable data access protocol (Dowler et al. (2010)) developed by the IVOA,3 provides output formatted into a standard XML file (VAMDC XML Schema for Atomic Molecular and Solid Data, VAMDC-XSAMS).4 The data-nodes are listed into a specific registry (Benson et al. (2009)), a sort of yellow pages service for discovering the VAMDC available resources. The current VAMDC registry implementation is derived from the AstroGrid project (Walton (2004)). may use a VAMDC client software: when the client forms a query, the client asks the registry about the availability and relevance of the data-nodes, and then dispatches the query to the nodes. Each node produces a standard VAMDC-XSAMS file. The client collects the returned file and displays the file’s content to the user. may submit his/her query directly to the specific node he/she wants to hit, after having discovered it on the registry. From the technical point of view, VAMDC may be seen as a distributed architecture, with no central management system. The Research Data Alliance5 and its Data Citation Working Group6 have provided the researchers and data centers communities with recommendations to identify and cite dynamic data (Asmi et al. (2016)). The proposed solution relies on a query centric view and the set-up of a Query Store. Data should be stored in a versioned time-stamped manner and accessed through queries. The Query Store stores all the identified and time-stamped queries together with the relevant metadata. It also gives access to the the data produced when a given query was executed. Within the context of the RDA recommendation the term “query” has to be understood in its wider sense: it stands for any processing mechanism used to extract data from a computer-based system. We already discussed (Zwölf et al. (2016)) how the VAMDC standards have evolved in order to meet the part of the RDA recommendation related to the versioning and to the data-timestamping. In this paper, we focus on the technical details about the implementation of the Query Store, i.e. for storing timestamped queries submitted to the VAMDC infrastructure. The goal of the Scholix initiative (Burton et al. (2017)) is to establish a high-level interoperability framework for exchanging information about the links between scholarly literature and data. It is an evolving lightweight set of guidelines that aims to increase interoperability and to enable an open information ecosystem. The objective is to understand systematically what data underpins literature and what literature references data. The Data-Literature Interlinking Service from OpenAIRE (DLI Service)7 is the first exemplar aggregation and query service fed by the Scholix open information ecosystem. The Scholix framework, together with the DLI aggregation, is designed to enable other 3rd party services (domain-specific aggregations, integrations with other global services, discovery tools, impact assessments etc). any evolution of the infrastructure automatically impacts all the connected databases (there are about 30 connected databases nowadays). as a consequence, the majority of the VAMDC Consortium members must validate any technological evolution of the infrastructure. Any adopted solution must lessen the load on the existing infrastructure members and have minimal implementing costs for each data-node owner. These constraints suggested to embed part of the solution into the node-software (cf. par. 2.1). an overlay to (and embedded into) the existing VAMDC node software, thus independent from any specific database. a coarse-grained one: a modification of any publicly available data at a given data-node induces an increment in the version of the data-node. We have indeed a mechanism for informing that something has changed on a given data-node: in other words, we know that the result of an identical query may be different from one version to the other. a fined-grained one: based on the introduction of the Version element into the VAMDC-XSAMS standard, as described in (Zwölf et al. (2016)). The information contained into the Version element indicates which data have changed between two different data-node versions. The Query Store is built over the coarse-grained mechanism. it notifies to a specific notification service of the Query-Store service the query-token, the content of the query, the version of the node and the version of the standards used for formatting the output. It is worth noting that this process is not blocking and has no impact on the existing infrastructure whatsoever: the data extraction process is not slowed down and, if the Query Store cannot be reached the user will still receive the VAMDC-XSAMS output file. If there is no such a query, the Query-Store service attributes a unique UUID and a timestamp to the new query, downloads the data, i.e. the VAMDC-XSAMS output file from the data-node and processes this file in order to extract the bibliographic information (each VAMDC-XSAMS file produced by the VAMDC infrastructure includes the references to the articles used for compiling the data) as well as metadata. The relevant metadata are stored and associated with the generated UUID. These metadata are kept permanently, while the downloaded XSAMS data are kept for an arbitrary time and then deleted (cf. remark 2 for a discussion). If such a query is already stored in the Query-Store service, the new couple (query time-stamp, query token) is added to the lists of the other time-stamps already associated with the query. statistics: it is interesting for database owner to know which queries are submitted and how many times a given query is re-submitted. This information is used for reporting to our founders and stakeholders. coherence of the human-interface: a user who has just re-submitted a query which was played for the first time long time ago by another user, may believe that there is some bug on the system if only the original timestamp is returned. By returning all the re-execution timestamp we avoid any ambiguity. troubleshooting and technical support: if something goes wrong on the Query-Store service before it issued the final UUID, we may use the token for identifying the query who generated the problem. Indeed the token is the first element generated into the query-notification pipeline. During the query-submission phase the user has no direct interaction with the Query-Store service (as we explained before, the data-node that answers the query, notifies directly its action to the Query-Store). When the user receive the data from the data-node he/she has no information about the UUID the Query-Store service assigned to his/her query. The user may recover the final UUID assigned to his/her query by sending the query token to a specific service endpoint of the Query-Store (plus further optional information, e.g. the user e-mail and/or ORCID, information about the used client, etc…). This mechanism is implemented into the VAMDC-client software and its complexity is transparent to the scientific-user. The functioning of the Query-Store is asynchronous. This was a mandatory constraint in order to avoid slowing down the VAMDC-infrastructure with a central bottleneck service. Indeed the Query-Store service response time could be slowed down if a huge number of queries comes in at the same time. Moreover computing the uniqueness of an incoming query may take some time if a very large number of queries is already stored. The asynchronous architecture solves these problems. A direct technical consequence of this asynchronous implementation is the combined generation of the associated tokens: the query-token and the query-UUID. The unique identifier assigned to each query is resolvable, and is both human and machine actionable. The associated landing page provides the metadata associated with the query, as well as the access to the queried data. Figure 1 represents a screen capture of the human-oriented landing page, whereas Figure 3 represents the data model behind the Query-Store service. Screen capture of the human-oriented landing page for a given query. The “Data source”, “Data source version”, “XSAMS version”, “Query” fields indicate respectively which data-node produced the result, the version of the data-node, the version of the standards when the query was processed, and the content of the query. The “Query identifier” is the UUID assigned by the Query-Store service to this query. The “Query Result downloaded on” list recall when this query was submitted (or re-submitted) and the “References” list contains the bibliographic references used for compiling the output file. For these, it is possible to switch between a tabular or a BibTex view (cf. figure 2). Finally a link gives access to the output file produced by the data-node while answering the query. Screen capture of the human-oriented landing page for a given query where a BibTex view is chosen for displaying the references. By clicking on the “Switch to References” button, one goes back to the display of figure 1. As we can see in Figure 3, some personal information is stored into the Query-Store service (mainly the query submitted by the user). This information is kept only for internal purpose and in order to get a better user experience (cf. par 4.1). Because of this personal information and in the context of the European General Data Protection Regulation, we are registrating the Query-Store service with the CNIL (French National Agency regulating Data Protection).11 All public interfaces of the Query-Store service are completely de-identified by virtually cutting the link “submitted-by” between the Submission and the Author classes: the queries contained into the Query-Store service may be browsed online in their anonymized form at the web-page: https://cite.vamdc.eu. 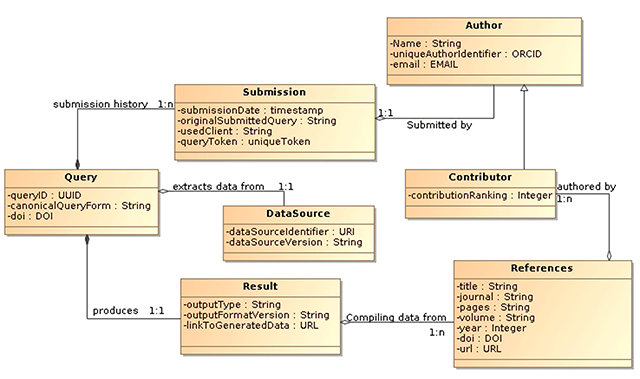 UML graphical representation of the data model used for organizing the metadata available in the Query-Store service. Remark 1 Comparing the sematic equivalence of two SQL queries is a problem which admits neither analytical nor close solution. This implies that ‘false negative’ may exist in the VAMDC-SQL comparator library which is built using the ANTLR parser.12 Indeed if two queries are considered identical, they are actually identical; however in some minority cases, two semantically identical queries may be considered different. Remark 2 Most of the queries processed by the VAMDC e-infrastructure are not used in a published work. It is therefore neither possible nor reasonable, to store the VAMDC-XSAMS data produced by all the queries for a very long term; data deletion is an operational requirement. The deletion mechanisms works as follow: the XSAMS-data produced by the data-node and stored on the Query-Store service are deleted only if the last (re-)execution of the query dates more than an arbitrary defined duration (5 years in our implementation). In other words, the data are not deleted if the query is too old but if the last query invocation is too old. Some specific queries (e.g. the queries associated with the Hidrogen H-α emission line, at a wavelength of 656.28 nm, are commonly used for solar observations or detecting Hidrogen in space nebulae) may be very old, but re-executed daily. It is worth noting that only the XSAMS-data associated with the queries may deleted. All the other information (Data Source name and version, the query syntax and identifier, re-execution timestamps, bibliographic references) are kempt permanently. The XSAMS-data associated with queries which have been assigned a DOI (i.e. which have been uploaded to Zenodo, cf. section 4.1) will never been deleted, regardless of their age. As we highlighted in the remark 2, most of the queries are not cited by published works, and after an arbitrary time the underlying data are deleted from the Query-Store service. On the other hand, we have queries generating data used and cited in published works. A lifetime access must be provided to these data. The interconnection with Zenodo provides the Query Store with Scholix functionalities and with lifetime access to the query-generated data. a reverse link, pointing from Zenodo to the Query-Store service query-entry, is introduced by putting into the field “Related Identifier – Is identical to” the resolvable persistent identifier of the query on the Query Store side (cf. remark 4 for a discussion about the relevance of this link). When the upload process finishes successfully, Zenodo provides the Query-Store service with a DOI and with a deposition identifier, that the Query Store curators may use further for administrating the upload on the Zenodo side. These two identifiers are stored on the Query-Store service and associated to the query. The deposition identifier is never returned to the users. When a user displays a query which has already been copied to Zenodo, the button “Get a DOI” is replaced by a DOI badge (cf. Figure 4). By clicking on this badge, the corresponding Zenodo record is displayed on the user screen (cf. Figure 5). This page also contains the instructions for citing this query-record. Different export fromats are supported (cf. Figure 6): Figure 7 gives an example of the Bibtex citation format. A citation for the query record we used for our example is (Consortium VAMDC (2018)). When a DOI is assigned, the “Get a DOI” button (cf. figures 1 or 2) is replaced by the DOI badge. Partial screen-shot of the Zenodo-record landing page: The mentioned query token is the one generated by the node serving the query (cf. section 3.1). The set of references are those provided by the Query-Store service during the submission phase. 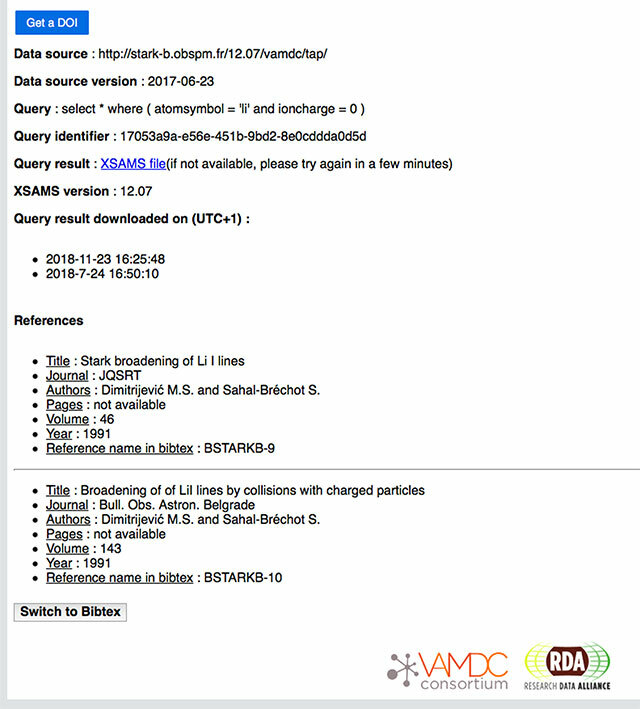 One can also see on the right side the reverse link (Related Identifiers) pointing to the original query record on the VAMDC side. 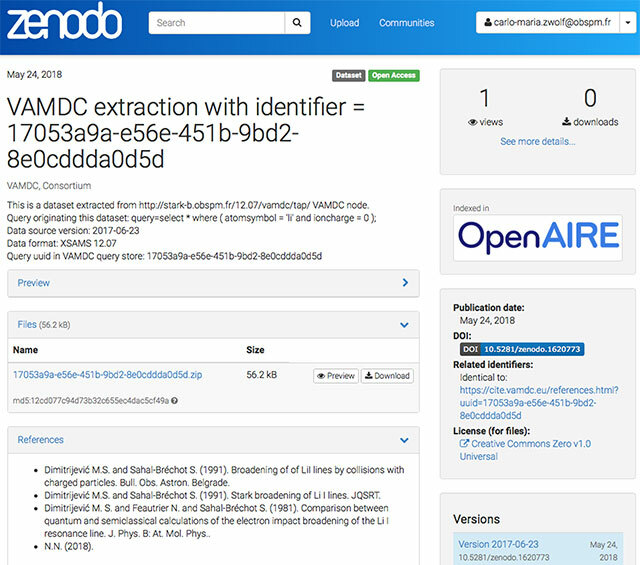 Partial screen-shot of the Zenodo-record landing page: this part of the screen displays the instruction for citing the current query-record. Bibtex format to be used for citing the query-record of this example. Moreover, the data deletion mechanism described in 2 is suspended for all the queries associated with a DOI (in other words, the underlying data are kept permanently on the Query Store side as well). Since Zenodo is indexed in OpenAIRE,16 and since the latter implements Scholix through its Data-Literature Interlinking Service,17 all the VAMDC queries registered by the Query Store in Zenodo are included in those infrastructures. 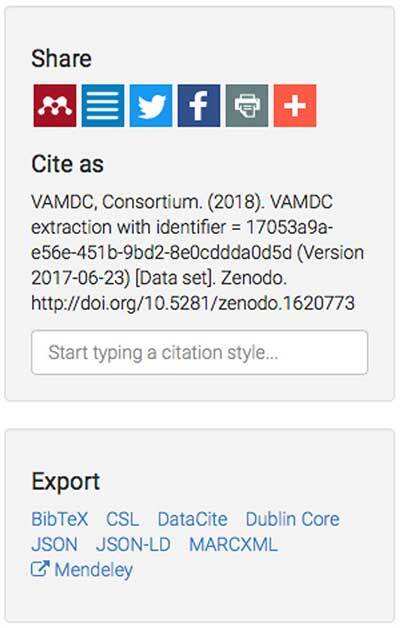 Therefore when some data extracted from VAMDC are cited (in papers and/or other datasets) through the DOI obtained by the couple (Query Store/Zenodo), the authors of the works referenced by the VAMDC data receive credits automatically. What has been described above is typical of the interoperability virtuous circle: if a system A implements some interoperability protocols and a system B implements some other ones, than a wrapping between A and B will disclose to A the interoperability capabilities of B. One could say that the interoperability-capabilities propagation speed is greater than the interoperability-protocols adoption speed. Remark 3 The upload-to-Zenodo process was described in this paragraph from a human point of view. In our implementation this process may also be completely machine actionated. Indeed, the computer architecture of the services described through this paper relies on a set of REST services. A user, or a computer program, may interact with these services by sending parameters (using GET and/or POST methods) to specific endpoints. All these services respond by providing JSON formatted output which may be automatically parsed. The Graphical Web User interface we presented in Figures 1, 2 and 4 are part of a lightweight html5 layer for interacting with and formatting output from these REST services. Remark 4 As Zenodo is an open repository (any person who has, e.g., a Github or an ORCID account may upload his/her productions to Zenodo), one has to pay the greatest attention to the provenance and to the scientific relevance of the works shared through this repository. In this context, the reverse link pointing from Zenodo to the Query-Store query-entry (see. Figure 5) gives users quality and provenance assurance on the shared datasets: the reverse link states that the data come from a well-known and documented database. The VAMDC funders and stakeholders regularly ask us to report on the outcomes of their investments, to track and demonstrate they have been used efficently. 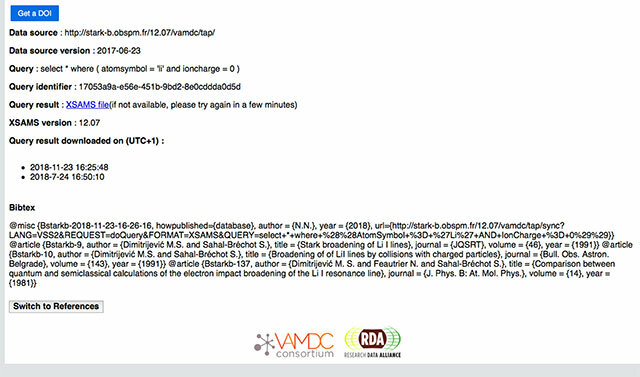 In this context the VAMDC Query-Store may play a double role: on one hand it may increase the impact of VAMDC (cf. section 5.1) and on the other it constitutes a fine-grained reporting tool (cf. section 5.2). As we underlined in (Moreau et al. (2018)), from the start of the VAMDC project in 2009, one of our goal has been to increase the citation impact of data producers. Indeed we find that the current status of citing spectroscopic data is to cite the database. It should be stressed that atomic and molecular data require months to be either measured or calculated, and therefore it is a loss of visibility and recognition that only databases be cited in users’ papers. We believe that the Query Store coupled to the VAMDC portal now allow this flaw to be overcome, even if additional refinements need to be carried out: on January 2018 we have started the deployement of the Query-Store data citation capabilities in the production environment. Currently these are deployed over a third of the Data-nodes of the VAMDC infrastructure. Since January 2018 the Query-Store service received ∼2000 queries. From these, ∼180 unique queries have been identified. The link between the Query-Store and Zenodo have been added in May 2018. Since then ∼10 queries received a DOI. This paper is the first peer-reviewed work where the technical details of the VAMDC Query Store are described, whereas (Moreau et al. (2018)) is the first article where the atomic/molecular science-aspects linked with the Query Store are discussed: at this point in time we cannot be sufficiently objective for evaluating how the usage of the VAMDC infrastructure has been altered by the implementation of the Query Store. We would like the Query-Store to boost the usage of VAMDC. For that reason, we have recently started collaborating with the main Astronomy and Physics Journal editors so that they may have their paper-submission workflows adapted for interacting directly with the VAMDC Query Store. Our goal is to make the Query Store indispensable for all the author publishing papers citing atomic or molecular data. During the submission phase, the author may put references to data using the DOIs assigned by the Query Store, as it is already the case for papers. We are working with editors for achieving this integration. All the actors will obtain benefits: VAMDC will increase its impact and its usage, editors will gain an efficient tool for data-paper linking and data producers/providers will benefit from the automatic citation mechanisms. From the earlier discussion with editors, we have identified some improvement targets, described in section 5.3. As described in on (FAIR Data (2018)) (Recommendation 6), data practitioners should facilitate the inclusion of a wide range of indicators for the assessment of the scientific and technical contributions to data-related activities: provision of data infrastructure ans services should be recognized and rewarded accordingly. In order to be able to measure all the contributions (together with the specific role of each contributor) we are planning to extend the range of metadata to be sent to Zenodo. Indeed Zenodo adopts the DataCite Metadata Schema for the Publication and Citation of Research Data (DataCite Metadata Working Group (2017)). 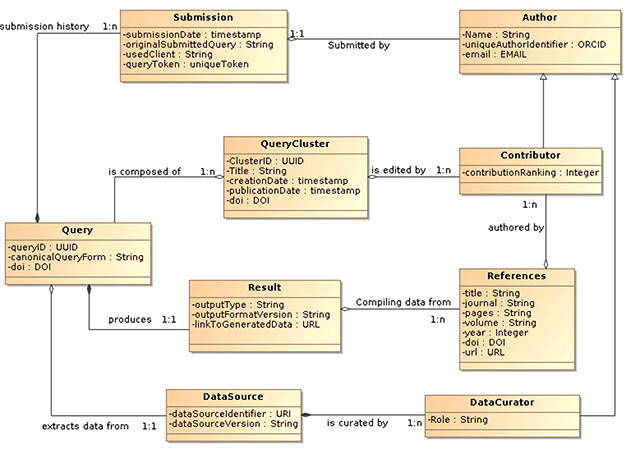 This schema is very rich and contains several optional parameterswe we would like to exploit: we think that the fields “Contributor – Data Collector”, “Contributor – Data Curator”, “Contributor – Data Manager” are very valuable since, by filling those fields, we may mention and acknowledge with bibliometric credits the work of people involved in VAMDC data-infrastructure maintenance and curation. Nowadays this technical work is anonymous and mostly invisible for the scientific final users of VAMDC. The VAMDC registry (cf. 2.1) already contains the names of the scientific and technical maintainers of each data-node, however, there do not exist machine actionable mechanisms for extracting this information from the current version of the registry. We are developing such a service: while registering to Zenodo a query processed by a given data-node, the Query-Store service will extract -directly and on the fly- from the registries the information about the scientific and technical curator of the data-node. The Zenodo fields concerning the “Data Contributors” will be populated accordingly. publish to Zenodo the query cluster he/she is first-authoring. This will assign a DOI to the cluster. the author who wrote a paper referenced by the result of a Query. Graphical representation of the meta data associated with a query cluster: Each cluster is created and/or modified by specific contributors (a first author, a second author, etc.). Each author may add to the clusters the Queries he/she performed (provided the query related data are still present and not deleted from the system, cf. remark 2). Each Query produces a result by extracting data from a specific data source. Each result has a list of references, i.e. the list of all the publication used for compiling the result. The unique identifier of each Cluster is resolvable and the associated landing page will contain all the cluster-associated metadata, together with access to the underlying data (i.e. all the data coming from the extraction performed by the queries composing the cluster). All these three levels of authorship are important and, through the Zenodo metadata schema (cf. par. 4.1), will receive credits when a given Query Cluster is cited through its DOI. on increasing the impact of the described citation services through community awareness-raising and training around these new tools, as we suggested in (Moreau et al. (2018)). Working with editors for integrating the VAMDC Query Store in the paper submission workflows (for paper citing atomic and molecular data, cf. section 5.1). We are focusing our efforts in this collaboration with editors because we believe this is a key action to consolidate the VAMDC position as a leading infrastructure for sharing atomic and molecular data. 2https://www.rd-alliance.org/groups/rdawds-scholarly-link-exchange-scholix-wg, which is a follow up of the RDA/WDS Publishing Data Services WG (https://rd-alliance.org/groups/rdawds-publishing-data-services-wg.html). 8We implemented these web-services using the Java Servlet technology©. The source code is released with a ‘Creative Commons 4 (By, Nd, Nc)’ license on GitHub: https://github.com/VAMDC/QueryStore. 10A query may be re-executed several times. Each execution has a different query-token. 11Since the Paris Observatory hosts the Query-Store service and is the legal representative of the VAMDC Consortium, we are subject to French law. 15Automatic checks are implemented in order to avoid to register twice a given query. We would like to thank the anonymous reviewers for their comments, which helped us in improving the clarity of this article. Support for VAMDC has been provided through the VAMDC and the SUP@VAMDC projects funded under the “Combination of Collaborative Projects and Coordination and Support Actions” scheme of the Seventh Framework Program. Call topic: INFRA-2008-1.2.2 and INFRA-2012 Scientific Data Infrastructure. Grant Agreement numbers: 239108 and 313284. The Query Store was partially funded by the European Project RDA EU3 (funded under H2020-EINFRA-2014-2, project ID: 653194). We acknowledge support from Paris Astronomical Data Center of Paris Observatory. Asmi, A, Rauber, A, Pröll, S and van Uytvanck, D. 2016. Citing Dynamic Data – Research Data Alliance working group recommendations. In: EGU General Assembly Conference Abstracts, volume 18, EGU General Assembly Conference Abstracts, EPSC2016–7456. April 2016. Benson, K, Plante, R, Auden, E, Graham, M, Benson, K, Plante, R, Greene, G, Hill, M, Linde, T, Morris, D, O’Mullane, W, Rixon, G, Stébé, A and Andrews, K. 2009. IVOA Registry Interfaces Version 1.0. IVOA Recommendation 04 November 2009. Dowler, P, Rixon, G and Tody, D. 2010. Table Access Protocol Version 1.0. IVOA Recommendation 27 March 2010. European Commission Expert Group on FAIR Data. 2018. Turning FAIR into reality. Final report and Action Plan. URL: http://www.codata.org/news/254/62/Turning-FAIR-Data-into-Reality-Report-and-Action-Plan-Consultation-until-5-August. Hey, T, Tansley, S and Tolle, K. 2009. The Fourth Paradigm: Data-Intensive Scientific Discovery. Microsoft Research, October. ISBN: 978-0-9825442-0-4. URL: https://www.microsoft.com/en-us/research/publication/fourth-paradigm-data-intensive-scientific-discovery/. Moreau, N, Zwölf, CM, Ba, Y-A, Richard, C, Boudon, V and Dubernet, M-L. 2018. 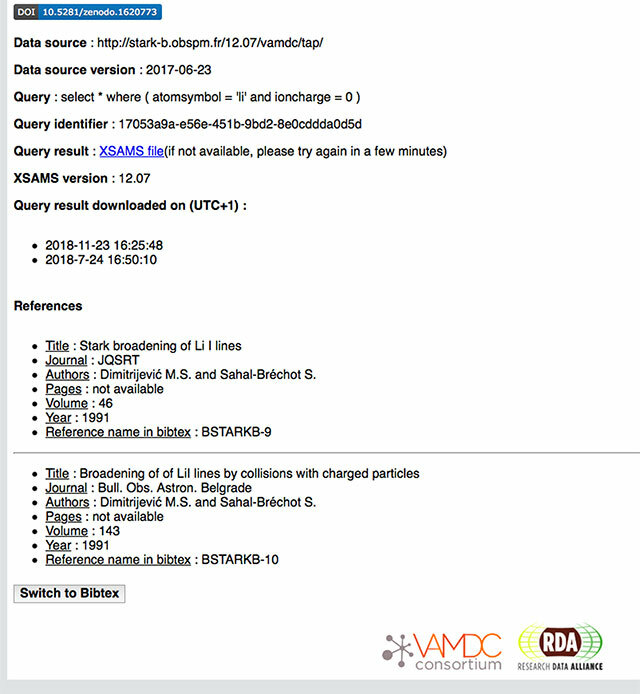 The VAMDC Portal as a major vector of atomic and molecular data citation. Galaxies, pages galaxies-326995. VAMDC Consortium. 2012. VAMDC SQL Subset, version 2. VAMDC standard. http://vamdc.eu/documents/standards/queryLanguage/vss2.html.